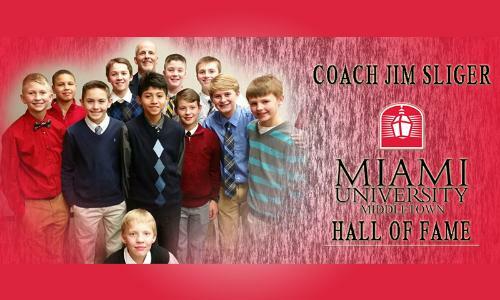 Monroe Jr. High Boys Basketball Coach, Jim Sliger, was inducted into the Miami University Middletown Hall of Fame on January 23, 2016. Coach Sliger was invovled in Miami University Middletown athletic department since 1976. He began as the head girls basketball coach and also helped as a Golf, Baseball and Boys Basketball coach. Check out a great article covering some of the career of coach Sliger. Since coaching in Monroe coach Sliger has been a huge influence on the young men in the Monroe basketball program. Pictured are members of the 2015-16 7th grade boys basketball team who surprised Coach Sliger by attending his induction at Miami Middletown. Congradulations to Coach Sliger and his family from all of Hornet Country on this well deserved recognition.